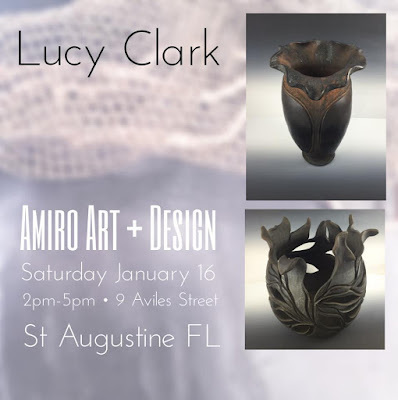 Lucy Clark will be joining us at Amiro Art and Design on Saturday Jan 16th from 2-5pm to discuss her art, inspiration and expertise. Come and meet the artist behind the beautiful Obelisk 450 project “The Flight to Freedom” seen outside the Florida School for the Deaf and Blind. Using hundreds of hand sculpted earthen feathers, her obelisk was a testament to the spirit of the Timucuan Indian tribe. Her intention with her chosen medium of hand built pottery is simple; to allow the eye of the beholder to experience movement and beauty in each piece that she creates. "To me, life is a work of art always in progress and only finished when we take our last breath. It is through this belief that art informs all that I am and all that I do. Even within the daily routines that consume so much of our time, art is alive and only waits for our notice. With time and age I’ve discovered ways to let my authentic self play out in who I am and the events of my life, but something always seemed missing. My first pottery teacher called it “finding your voice”. I found my voice when I created my first hand built piece of pottery. In the past few months, I have made a move to the beautiful mountains of North Carolina, finding that within these mountains my vision for my work has expanded beyond what I thought possible. Running my own business for over 25 years made control a necessary part of my world. With clay, I’ve learned the opposite. By letting go of control I am able to see what the clay wants me to see. When I truly let go, I can create beauty. It flows from the very essence of my being. As with much in life, what we’ve done in the past can play a part in the new that we desire. My 20+ years as a massage therapist have taught me that human muscles respond not to control and force, but to the intuitive work of my hands to find what the body needs me to find. It is this experience that allows me to feel the clay and to hear the voice of the art within waiting to be released."